The 10” working width makes the T24C easy to handle and control through the soil. Comfortable handlebar controls eliminate the need to bend down to change the speed or turn the engine off. The T24C uses a 2-stroke petrol engine to power the rotors through the ground. The variable speed allows the user total control of the tilling speed through different soil types. 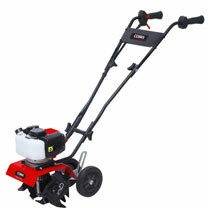 With the transport wheels in place the tiller can be wheeled from area to area quickly and easily. Carrying the tiller can be kept to a minimum. The 2-stroke engine used on the Cobra T24C is a powerful 43cc and will use a petrol & 2-stroke oil mix. Mix these before adding to the fuel tank so you don’t risk seizing the engine with the wrong mixture. Working width 23.5cm.